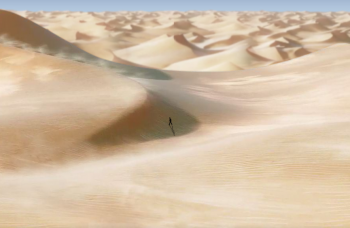 Sony is teasing a project that involves an extremely lonely human being wandering through the desert. The official PlayStation website has been updated with a strange teaser set to expire next week. Grab a cup of water because it's probably going to make you quite parched. The teaser features a panoramic desert view with a silhouette slowly walking through it. As the desert wind blows, the man just keeps walking, step, after step, after step, after step. But wait! If you click on the silhouette, you can make him run for a short period of time until he gets tired. What is he running toward? More desert. Seriously, he's stuck in the desert. The teaser's timer will be up around June 2, when we'll hopefully find out what this mysterious desert man is all about. By my best guess, there are currently two Playstation 3 exclusives that it could be teasing - Uncharted 3 and Journey - but they've already been announced and detailed. Both games feature desert locales. Perhaps 2011 will be Sony's year of the desert? *Update*: Files reportedly extracted from the website hint that it's for Uncharted 3, so it could be counting down to a Japanese announcement. Not the most exciting revelation, but these things happen.